POLISH THOSE DANCING SHOES: Sing along to 50 years of classic music hits from artists such as Elvis, Queen, The Beatles, The BeeGees, Jackson 5 and Australian icons including John Farnham and ACDC. FOLLOWING on from their 2018 sell-out concerts and celebrating the most iconic artists of the 20thcentury, internationally acclaimed group Boys in the Band are excited to announce their brand new concert experience Jukebox Revolution...every record tells a story! performing at Twin Towns Clubs & Resort on Friday 24 May. Launching at the iconic Adelaide Fringe Festival on March 1 to five-star reviews and voted as the number two "must-see show" of the festival by 2AA's Jan Reilly, the group is now on a 40 date national tour visiting capital cities of Melbourne, Perth, Sydney and Canberra plus regional theatres across the country. The "feel good show" travels through 50 years of classic music hits from artists such as Elvis, Queen, The Beatles, The Bee Gees, Jackson 5 and Australian icons including John Farnham and AC/DC. The cast warn audiences "you better warm up your voices and polish those dancing shoes because there'll be lots of singing and toe tapping!" Australia's most talented leading men, Hugh Barrington (We Will Rock You, All Together Now), Damon Grebert-Wade (Grease Arena Spectacular), Keane Fletcher (Ten Tenors) and Justin Rynne form a powerhouse cast that sing, dance and front a sensational live band. Seasoned performer Keane Fletcher says: "It's a non-stop, high-energy show that has something for everyone, it's all the hits you know and love, just like any good jukebox should be!" Boys in the Band performed at the 2018 F1 Singapore Grand Prix, a return performance for the group who over the years have supported Bon Jovi, Maroon 5 and Pharrell Williams at the prestigious event. Other highlights have included performances in Johannesburg, Jakarta, Wynn Casino Macau and Australian venues and events such as Arts Centre Melbourne, The Star Gold Coast, Toowoomba Carnival of Flowers and Melbourne Zoo and Sydney Taronga Zoo Twilight Concert Series. The show's creators, Dale Burridge and Dave Malek, say: "We can't wait to bring our brand new show to Aussie audiences. It's a non-stop rollercoaster ride through 50 years of iconic hits from the world's most-loved artists. We dare you to stay in your seats!" 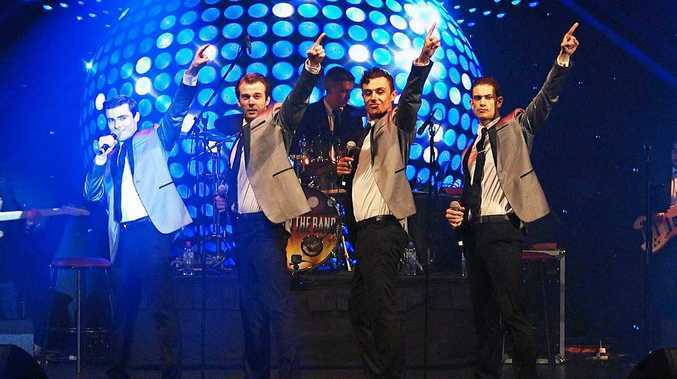 Boys in the Band perform at Twin Towns Clubs & Resorts 8pm Friday May 24. Tickets from twintowns.com.au or call 1800 014 014.